I'm so excited to be part of the Trendy Twine Design Team reveal for July. We are featuring Berry Red twine, which is perfect for the Fourth, of course, but the classic red/white combination is a great go-to color for any project. The Trendy Twine blog, Twine it Up!, is full of patriotic projects today featuring twine. There are so many fun and creative ideas on the blog. Check them out! 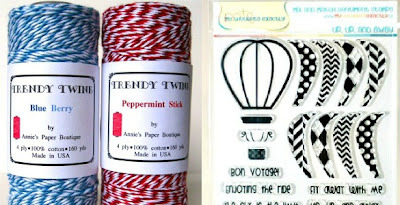 Trendy Twine also has a new challenge posted for July with a great giveaway: an extreme mini pack, which is 10 colors of Trendy Twine + 20 yards of the Berry twine we're featuring this month. You can find all the challenge details here under the Design Team projects. You can also purchase Trendy Twine here at Annie's Paper Boutique. So many beautiful colors. It will be hard to choose. Just warning you. Thanks for stopping by. I hope you have a wonderful July 4th holiday. just adore all of the layering here and attention to detail! This is the cutest card!!! I LOVE it! It is so festive and fun. TFS. This is BEAUTIFUL!!! LOVING the 4th flag and the journal bits on the side!!! this is adorable!! You nailed it~award winning card!!!! What a darling card Izzy! Beautiful work! This is the perfect July 4th card, Izzy! Love the boy with the banner. You found the perfect letter stickers to fit on there. :) The stars are a great addition too! This is a fantastic card. I love that little boy! Really loving that peppermint twine too! Beautiful card! You evoked that small town parade feeling perfectly! Love the details in this card! What a beauty! Izzy, this card is amazing! Wish I could put together such a adorable card. Great job. Awesome card! The mix of color, pattern and texture is perfect! Such a sweet card. It does remind me of days gone by and a much simpler and easier time. I love it!! Seriously such a cute card. Love the details. Is the background fabric or paper? Either way I love it!!! I love the vintage feel of your adorable card. I have used some of my twine stash lately, fun stuff. I am quite sure I NEED that balloon stamp, how cool. Love the combination of bright crisp stickers and papers with the canvas background! And the little boy with flag....PERFECT! Happy July 4, Izzy :) May you be blessed with a sunny, fun-filled day of parades and picnics! Does not get CUTER than this! LOVE in EVERY way possible! Cute card, love how the Berry Red Trendy Twine just pops against the background colors! Are you kidding me?! The stitching on this card is fabulous and I love your design so much. Just awesomely fabulous! 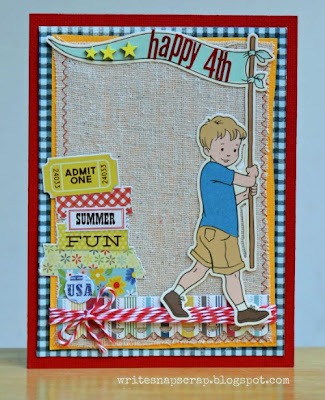 Your patriotic card is truly darling! 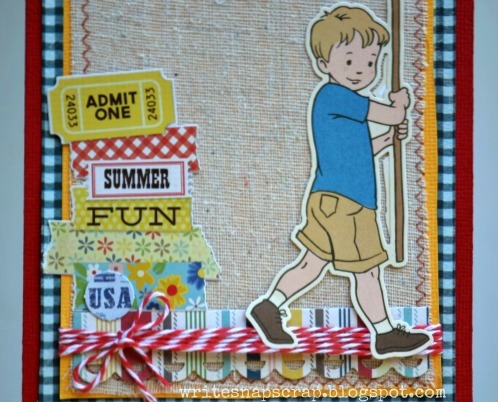 I love the sweet image of the little boy and all the clustered embellishments! I love your card, Izzy!!!!! What a sweet card, Izzy.